Today I caught my eye on something I saw in the store it was so shiny I had to pick it up and buy it. But something else I actually wanted to try what it would taste like. 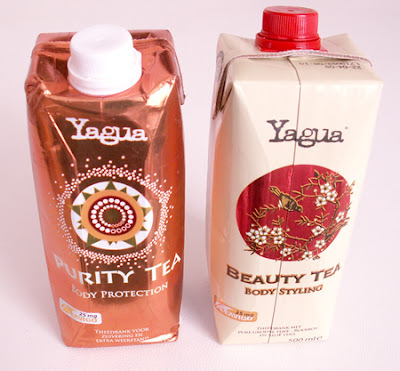 This unkown dutch company Yagua brought a set of health drinks in tetra pack in the supermarkets. Allot of different things for improving you health. Most of the packaging are not like these, but I like the looks of these two packaging, how ever both are not really showing what the products are. Best part I liked are the shiny ink they used and the illustration they made. One is a bit like aboriginal art and other and Japanese or Chinese art. Both packaging got a silver or chrome base colored cardboard and got transparent ink printed over to get the shine effect in other colors. The tea isn't really bad, how ever not really something I would want to drink too much. Really explosion of taste cause it a mix of different herbal teas. But I am not if everyone would like the taste. I think most Asian people don't mind the taste of this though. Bad part only on these packaging is that there is always allot left in these tetra package. You need to cut it open to get the last few drop out. The graphics is not really impressive or showing what it does. 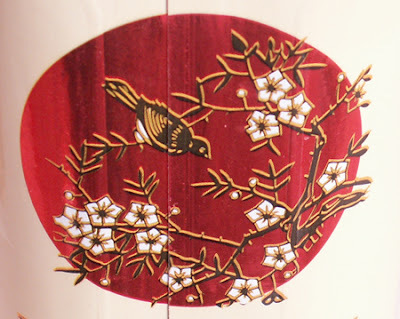 The aboriginal art could been a softdrink and Asian art could been just some Asian tasted tea. They should have tried to add something showing about purifying your body.